Cunard’s famous ocean liner Queen Mary 2 will mark 10 years of service on Jan. 8, a decade since Queen Elizabeth II christened the vessel in Southampton, England. What has the ship done in those 10 years? - Sailed the equivalent of three times to the moon and back. - Carried more than 1.3 million passengers and more than 2,000 dogs. - Served over 58 million meals, 21.9 million cups of tea and 1.25 million bottles of champagne. - Baked 2.7 million scones, which, if stacked on top of each other would be 80 miles high. We knew she was something special. 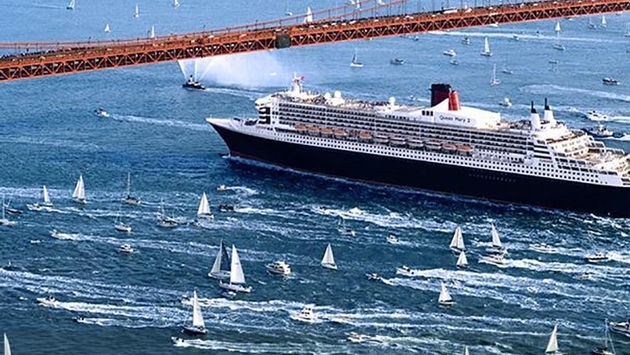 The Queen Mary 2 was built for crossing the Atlantic Ocean and has done so more than 200 times. Cunard boasts that the QM2 is the most famous and fastest passenger ship in operation today, and indeed, it’s hard to argue with that. QM2 will depart on her 10th World Cruise on Jan. 10, sailing with fleetmate Queen Elizabeth from Southampton after a fusillade of fireworks. The major 10th anniversary celebrations will begin in earnest on May 9 when all three Cunard ships will arrive in their homeport of Southampton. That day, Queen Mary 2 will depart on the first of two commemorative crossings to and from New York. Those special crossings will underline her role as the only passenger ship in the world maintaining scheduled service across the Atlantic, something a Cunard ship has done since 1840. Special guests will be Commodore Ron Warwick, the first master of QM2, and Stephen Payne, who was largely responsible for the overall design of the ship. Fares for these celebratory May 9 and May 16 crossings start at $1,099 per person, double occupancy. If you’re enticed to book a voyage, Cunard is offering free balcony and suite upgrades and free gratuities for bookings made by Feb. 28 using the promo code R2W. More than 134 voyages are eligible. The “Royal Upgrade Celebration” includes double upgrades on most seven-, 14- and 21-day Mediterranean and Northern Europe voyages, which means guests can sail in a balcony stateroom for the same fare as an inside or get a Princess Grill Suite for the same fare as a Club Balcony. It also includes free gratuities for two people. Reduced deposit is $150 per person, and it’s refundable. Complimentary upgrades are also available on trans-Atlantic crossings and voyages in Canada/New England and the Caribbean.